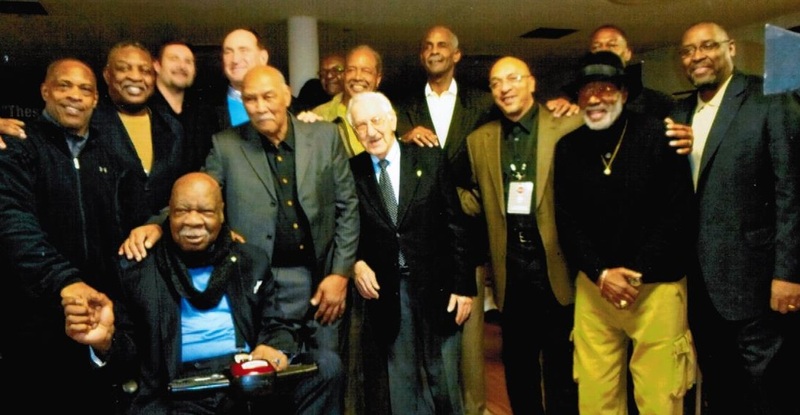 Lou Schwartz, ASA President, is Special Guest at “Legends of Basketball"
February 20, 2015 - The New York City Chapter of the National Basketball Retired Players Association (NBRPA) held its VIP “Legends of Basketball” reception on February 13 in Harlem as part of the NBA All-Star Weekend Festivities. Lou Schwartz, President of the American Sportscasters Association (ASA), attended the event at the request of its hosts, Bernie D’Andrea, CEO of the World Food and Beverage Group, and Tom Hoover, President of the NY Chapter of the NBRPA. Hoover enjoyed a five-year professional career with the NBA’s St. Louis Hawks and New York Knicks as well as ABA teams including the New York Nets and Dallas Mavericks. Among his many endeavors, Hoover is currently the VP of Community Affairs for Fairway Markets, an upscale supermarket chain serving the New York tri-state area. Among the many former NBA players in attendance were Nate "Tiny" Archibald, the New York playground legend who enjoyed a 14-year NBA career most notably with the Cincinnati Royals, Kansas City-Omaha Kings and Boston Celtics; as well as former New York Knick and Syracuse National Cal Ramsey. Since 1983, Ramsey has served as an assistant men’s basketball coach at his alma mater, New York University. He is also fondly remembered by Knicks fans as the team’s color analyst during the late 1970s.